After Jack Lang impulsively buys the house directly across the street from his own, his wife, Beth, has finally had enough. She leaves him- and their six-year-old autistic son, Hendrick-for Jack's best friend, Terry Canavan. Jack tries telling everyone he's okay, but even he's not so sure. When Hendrick, who rarely talks, starts speaking in fluent Spanish, Jack knows he's in uncharted territory. But once Canavan's ex- girlfriend Rena turns up at his door to see how things are going, Jack begins to suspect the world could be far more complicated than he'd ever believed. 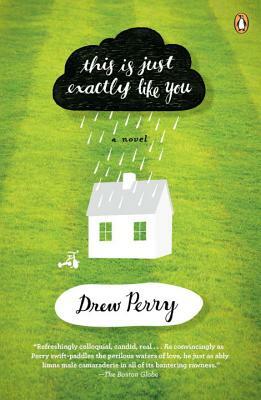 Set against a landscape of defunct putt-putt courses and karaoke bars, parenthood and infidelity, This Is Just Exactly Like You is a wise and witty debut novel with captivating insights into marriage, autism, suburban fiasco, and life's occasional miracles. Drew Perry holds an MFA in creative writing from the University of North Carolina–Greensboro, and now teaches writing at Elon University in North Carolina. His short fiction has been published in Black Warrior Review, Alaska Quarterly Review, and New Stories from the South. He lives with his wife in Greensboro, North Carolina.